Garlic is a must-have for the kitchen, and it grows well in Western New York. What you might not know is that it comes in an amazing range of flavors, said Tom Szulist. 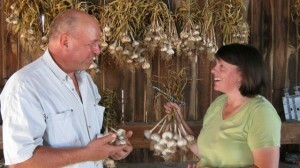 He and his wife Vivianne Singer Szulist own Singer Farm Naturals, which specializes in growing organic gourmet garlic. “Spanish Roja is the king of all garlics,” Szulist said, pointing to some of the garlic he has harvested on the farm in Appleton, which is in Niagara County. Spanish Roja generally comes out at the top of taste tests. Kilarney Red, named for the family that developed it, is a variation of the Spanish Roja and has a peppery taste. Then there’s Metechi, the hottest of all the garlics. Singer Farm Naturals has limited production of about 20 varieties of garlic now, and Szulist expects 2012 will be their biggest production year. He hopes to eventually have 100 varieties available. While the various varieties of garlic taste different from each other, they all look very much the same to the beginning garlic grower. (The garlic in our first photo compares cleaned garlic to newly harvested garlic.) If you plant several varieties, make sure you label them well. You can plant garlic after the last full moon in October, which this year occurs on Oct. 23. A good rule of thumb, Szulist said, is that you can plant garlic in late October through November, and sometimes as late as December, weather permitting. Garlic doesn’t like wet feet, he said, so it’s best to plant it in a raised bed. How deep should you plant the garlic? It depends on the size of the clove, he said. If the clove is an inch tall, you want an inch of dirt above it. If the clove is 1 1/2 inches tall, you want 1 1/2 inches of dirt above it. If you buy garlic in the supermarket, it may have originated in another country and may have been fumigated, so it may not grow. If you buy organic garlic, you can be sure it hasn’t been fumigated and will grow, he said. There are two categories of garlic: hard neck and soft neck, Szulist explained. Both kinds will grow here, and hard neck does especially well. Hard neck garlic doesn’t store as well. However, it does get a cool flower called a “scape,” which you can see in the photo at left. The scape can be eaten, too. If you allow the scapes to remain in place, they will produce “bulblets,” which you can see in the photo at right. 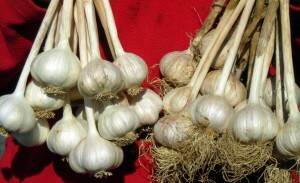 You can plant these seeds, but Szulist said that the bulb of garlic produced will be small. 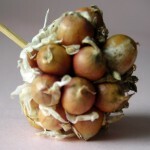 It will take three years to produce a large bulb of garlic using bulblets. 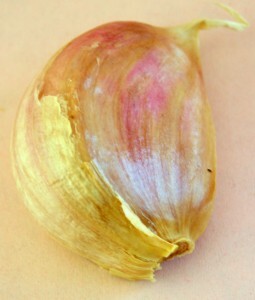 In addition, the garlic produced may be different from the original plant. 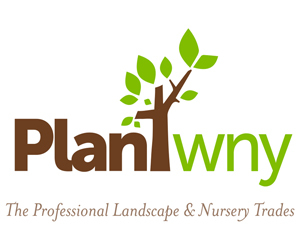 He recommends using cloves of garlic to start your plants. Soft neck garlic doesn’t get a scape. It tolerates a hotter climate, and the winter doesn’t have to be as cold. It will last longer in storage. Szulist is passionate about garlic and said he would be happy to answer questions from our readers. 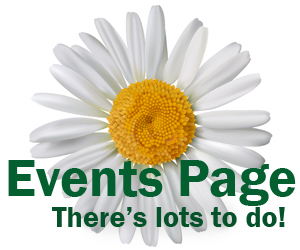 You can leave your question on our comments section below, or contact him through his web site. The photo of Tom and Viv Szulist is from the Szulists. The photo of the garlic scapes is from Going Local. All other photos are by Connie Oswald Stofko. I came upon this through my friend Jaime, above, and can’t wait to come and visit your new place. I am very excited for you and this new adventure. Sorry I couldn’t make your hay bale weekend, but we were out of town buying a sailboat! Good luck on this. Now I see what you have been talking about! I will have to come and try out your garlic varieties. Love the one with the whirly curly stalk! ?? I`ve been eating masses to help combat an early cold and it has helped! such a health giving as well as delicious plant. Be wary of the nematode that is recently causing blight in garlic. It stays in the soil and is spread via the seed. Rotating your plantings of garlic will help keep the incidence of this down. What is the exact name of the wryly curly variety?? Had it at our home if 30 years and didn’t take any bulbs? I don’t know what you mean by wryly curly variety. Are you referring to the garlic scapes? That curly part is the flower stalk of the garlic plant. 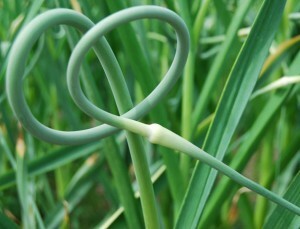 You don’t need to have a particular variety of garlic to get garlic scapes, just plant any variety of hard neck garlic. Was referring to the plants with the “bird like @ top. Thanks for the info, much appreciated!